Victory, Sacrifice and Questions of ‘Collusion’ Mosul is liberated, a fallen policewoman is mourned, and Donald Trump Jr. is exposed. Three important things happened this week. Two were insufficiently noted. Iraq’s second-largest city, Mosul, fallen three years ago to Islamic State, was liberated by forces of the Iraqi government. Not long ago ISIS, the first and true sustained scum of the 21st century, was seen as militarily formidable and ideologically perhaps indomitable. Now they’ve disappeared into the hills. The fall of Mosul is a blow to their mystique, and that of radical Islam. As for the Iraqi military, not long ago it was derided as unprofessional and barely loyal to its own country. Now it has succeeded, with the help and encouragement of the U.S., including its special forces. This is a victory. For what? Civilization. The second story too involves admirable people in uniform. This week the New York City Police Department buried one of its own, also one of our own. We should put aside a moment to mourn. 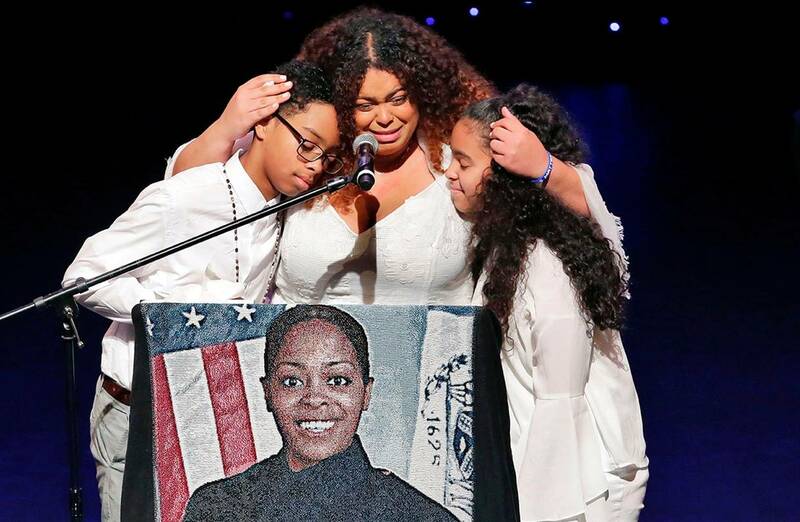 The murdered officer was Miosotis Familia, 48, reportedly the youngest of 10 children of Dominican immigrants and the first in her family to attend college. She had three children and cared for her own ailing mother. She’d been a cop for 12 years. She was one of the people who keep my city of 8.5 million up and operating each day, in both its personal and public spheres. She was on the midnight shift in the Bronx on Wednesday, July 5. Her killer, 34-year-old Alexander Bonds, was a lowlife and prison parolee with untreated mental illness. He posted threatening anticop rants on Facebook. The night of the murder he walked up to her police vehicle and fired once through the window, shooting Officer Familia in the head. Police shot him dead soon after. Unnamed but a clear focus of Mr. O’Neill’s remarks was the radicalism and rage of the Black Lives Matter movement, coupled with a national media too often willing to paint the police, in any given incident, as guilty until proven innocent. This sets a mood that both excites and inspires the unsteady and unstable. It should be a major, sustained national story when cops are killed for being cops. Yet each incident never gels into a theme. The media caravan moves on. Orwell spoke of forcing inconvenient stories down the memory hole. It is a feature of our age that we now force them down the hole before they’ve had a chance to become a memory. Now to the story that did get attention. Can you hear your columnist sigh? Donald Trump Jr. ’s adventure with sketchy characters claiming to represent Russia made me think of a quote from a deadly old 19th-century European diplomat. It’s no trick to fool a man who thinks himself clever, he said, but a plain, honest man—that can be a challenge. One of the things campaigns always have to watch out for is bumptious oafs who think themselves sophisticated. The White House defense of the Trump Jr. meeting is essentially a question: Who wouldn’t take a meeting with someone who has negative information on your political opponent? But that’s not the question. This someone was purportedly representing a foreign government. And that government was an adversary of the U.S.
Who wouldn’t take that meeting? Anyone with a brain and a gut. Anyone who didn’t think “House of Cards” is a moral template for modern political behavior. Former opposition researchers are angry. I asked one, who worked in George H.W. Bush’s 1988 campaign: Suppose a representative of a foreign state, or a person claiming ties to that state, contacted you and said: “We have some dirt on your opponent.” What would your reaction have been? “Immediately we would have walked away,” he said. He recalled there was chatter in 1988 that the Stasi, East Germany’s domestic spy agency, had dirt on the Democratic presidential nominee. The Bush campaign rejected any possible contact out of hand. “There’s such a thing as self-discipline,” he said. It is wrong to let another nation take an active role in a campaign for the U.S. presidency. It is imprudent, and also rather unpatriotic. It’s not their government, it’s ours. It can be assumed that we will attempt to look out for America’s interests, and they will not. What should Donald Trump Jr. have done when the music promoter urged him to meet with the representative of the Russian government who had secret, big-league, deep, dark info on Hillary Clinton ? I add: And send word of the contact to Mrs. Clinton’s campaign, with the information that you have not and will not respond. Because that would have helped our political civilization. Was it collusion? It was worse, it was classless.